The Colby College Concert Series presents the Modernistics in a toe-tapping show of hits from the Great American Songbook, with favorites like Sunny Side of the Street, Paper Moon, Georgia on My Mind, Bye Bye Blackbird and It Don't Mean A Thing If It Ain't Got That Swing. Also on the program: sizzling bebop numbers by Dexter Gordon and Bud Powell. 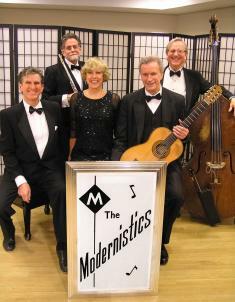 The Modernistics are the charismatic singing and dancing team of Ted and Pamela Powers, with virtuoso jazz musicians Peter H. Bloom on flute, Mark Leighton on guitar, and Dave Zox on double-bass. Peter H. Bloom, praised for his "hip, jazzy flute work" (Allaboutjazz.com), has concertized in North America, Europe, Asia, Australia and New Zealand and is featured on 45 CDs. He has shared the stage with Charles Neville, Sheila Jordan, Jaki Byard and other jazz greats, and is a veteran of the illustrious Aardvark Jazz Orchestra (46th season). Mark Leighton is acclaimed as a jazz and classical guitarist, performs widely, and has served on the applied music faculty of Colby College for more than 30 years. 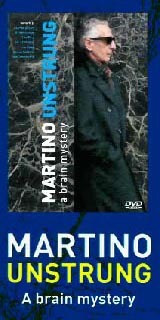 He studied with noted guitarists Sharon Isbin, Robert Sullivan, and David Leisner. Ted Powers' career in jazz, blues, and pop includes several years as a solo performer in the south of France and tap-dancing in the U.S. with the legendary Jimmy "Sir Slyde" Mitchell. Pamela Powers has performed and taught in the United States, Germany and England. She studied with Harold Nicholas of the iconic Nicholas Brothers and with renowned Broadway choreographer Charles Hughes. Bassist Dave Zox has performed with the Glenn Miller Orchestra, the Artie Shaw Band, Herb Reed and the Platters, John Abercrombie, Kenny Werner, Phil Woods, and other notables.